Big Data - News, Views and Reviews: How to use big data to predict utilization of a wireless network? Big data has been put to many uses ranging from predicting error in code to increasing chances of finding the next movie that you will like on your favorite streaming video site. In the paper "Big Spectrum Data: The New Resource for Cognitive Wireless Networking", the authors explore the possibilities of determining the utilization of radio spectrum used by mobile phones etc. For political and technological reasons the radio spectrum available for civilian use is limited in all countries and hence better utilization of this scarce resource is important to the phone companies, the governments and the end users as well. The topic of the paper is not relevant to many but I chose to cover it here for two reasons- 1) the monthly phone bill you pay can be impacted by this study and 2) the techniques described by the authors can be used in other areas. In this article, we investigate Big Data from a new perspective: Cognitive wireless networking. The motivation is driven by the following facts. The rapid development of mobile internet, mobile social networking and wireless IoT are all greatly hampered by limited radio spectrum resource. However, a number of spectrum measurement campaigns have demonstrated that radio spectrum is not physically scarce, but was vastly underutilized, with temporal and geographical variations in the utilization raging from 15% to 85%. To improve radio spectrum utilization, cognitive wireless networking is known as a promising paradigm, by mainly providing radio environment awareness-based dynamic spectrum sharing among heterogeneous networks. To obtain radio environment awareness, Geo-location Spectrum Database and Radio Environment Map are well recognized as the key enablers, which depend highly on efficient mechanisms to derive value from massive and complex spectrum data sets. However, to the authors’ best knowledge, so far there is no study to systematically tackle this vital topic. This article proposed to exploit Big Spectrum Data as the new resource for cognitive wireless networking to improve radio spectrum utilization. 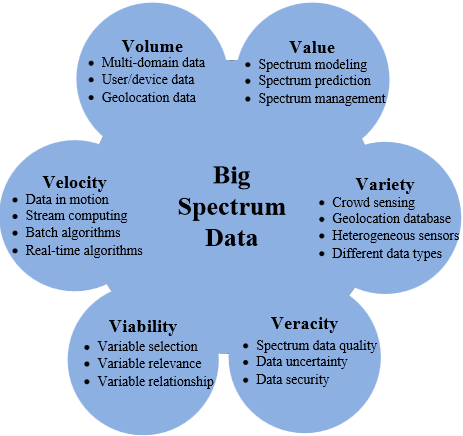 Both opportunities and challenges are discussed by first analyzing six-V-characteristics of Big Spectrum Data, and then providing a brief tutorial on the research frontiers as well as the emerging use cases. The Research and Development necessary for Big Spectrum Data goes well beyond the province of any single discipline, and there is the need for a thoroughly interdisciplinary enterprise. Solutions to the challenges ahead will require ideas from computer science and statistics, with essential contributions also needed from applied mathematics, from optimization theory, and from various engineering areas, notably wireless networking, signal processing and information theory.